As mentioned in several previous posts, my little helper, Miss Emily, has been working her way through the Harry Potter series, and after polishing off the last of the books recently, she was experiencing the post-reading withdrawal symptoms we all know so well. 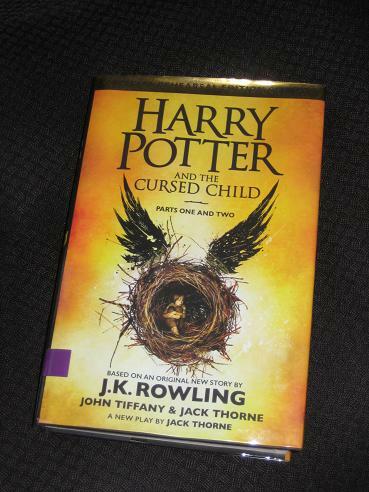 While it’s more replacement therapy than the real thing, our (temporary) solution was to put a hold on the script of the West End play based on J.K. Rowling’s wizarding world, and although my Potter-reading days are in the distant past, my daughter was keen for me to try it too (she needs someone to talk to…). So, after a long absence, for both Harry and myself, it’s off to Hogwarts once more, this time in the company of a whole new generation (how apt!). Harry Potter and the Cursed Child was written by script-writer Jack Thorne – from a concept he developed along with Rowling and the play’s director, John Tiffany – and takes us back to where the books left us, King’s Cross Station. Harry and Ginny are here to see off two of their children, with Albus about to begin his Hogwarts adventure along with his cousin Rose Granger-Weasely, and as the Hogwarts Express steams off, you could be forgiven for thinking that we’ve seen this all before. Harry: (seeing red) Well, there are times I wish you weren’t my son. There’s a silence. Albus nods. Pause. Harry realises what he’s said. Albus: You meant it, Dad. And, honestly, I don’t blame you. OK, negatives first. It’s not a novel. Obvious, of course, but it needs to be said because all the bad points of Harry Potter and the Cursed Child stem from its creation as the script for the play. I’m sure it’s a fantastic spectacle to watch (and would probably make for a couple of excellent films too), but most readers will feel that if only Rowling had felt up to it, this could have made for two superb additions to the series. Sadly, as entertaining as the scripts for the two parts are, there simply isn’t enough background here (detail, psychological description), and everything moves far too quickly. Because (and let me say this again) it’s not a novel, of course. The key to the story is the discovery of a time-turner (banned for years) and rumours of the possible mobilisation of many of Voldemort’s former allies. Hermione’s decision as the Mister for Magic not to destroy the artefact backfires as Albus, with the unwilling Scorpius in tow, decides to use it to right a wrong from the past, the death of Cedric Diggory in the Triwizard Tournament. The problem is that small changes in the past can cause major ripples in the future, to the extent that the world is changed forever by the actions of one angry little boy. Reviews I’ve read of the play have praised the character (and Anthony Boyle, the actor playing him), and he’s certainly a key part of the story’s success, particularly as a time comes when he has to set matters right again without his friend’s help. His relationship with his father is also touching, showing a very different side to Draco’s character. In fact, Draco is certainly enhanced, rather than diminished, by his appearance here. Initially, we get the bluster of the entitled blue-blood, the sneering of a man above the petty concerns of the other wizards. Yet as we learn more about his struggles (his wife’s early death, the rumours about Scorpius’ parentage), his character becomes far more complex, continuing the direction taken in the final novels. His relationship with his son is always strong, but part of his growth here comes in the allowances he makes and the steps he takes towards his old enemy, Harry Potter. Of course, even if he’s not always front and centre, it’s The-Boy-Who-Lived that has his name in the title, and Harry does have his moments. Much has been made in reviews and blurbs of his inability to adapt to peacetime, but apart from an inability to complete his paperwork to Hermione’s liking, he seems to be happy enough. His issues are more of a psychological nature, as he tries to come to terms with the fact that he can’t seem to connect with his son, and the anger that is never far from the surface spills over and pushes Albus even further away. It takes him far too long to find out that he has far more in common with his younger son than they both realise. When spares are spared, when time is turned, when unseen children murder their fathers: then will the Dark Lord return. A new story, a new threat – what more could you ask for? There were more than a few people who were disappointed to find this was a play script and not a novel.